The second House Benghazi Select Committee hearing took place last month. In one notable exchange between Chairman Rep. Trey Gowdy (R-SC) and Assistant Secretary of State for Diplomatic Security Gregory Starr, Gowdy asked for the name of the person the Committee needed to speak with to find out what the policy objectives were in Libya. “How can we judge whether or not a policy has failed or succeeded if nobody tells us what the policy objectives were? Who should we bring in to explain why were we in Libya?” Gowdy asked. As previously reported, documents confirm “we” were in Benghazi because of MANPADs—Man Portable Air Defense Systems, also known as shoulder-fired-anti-aircraft missiles, and arms trafficking. Weapons that were being “collected” in Libya were being moved into Syria. Starr, who was not serving in Hillary Clinton’s State Department during the Benghazi attack, directed Gowdy to the Near Eastern Affairs (NEA) and the Near East Asia Bureau to talk about the policy ojectives. Finally, he provided a name: Anne Patterson, the Assistant Secretary of NEA. 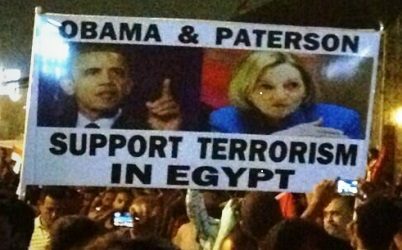 Patterson was the US ambassador to Egypt during the Benghazi attacks. Let’s answer Chairman Gowdy’s Libya policy objectives question. Unlike what became the violent and deadly 2009 Green Revolution in Iran, where pleas for US help from Iranians were ignored after they challenged the re-election of then President Mahmoud Ahmadinejad and the Mullah theocracy, the Obama administration’s Arab Spring policy was to support the overthrow of regimes in Tunisia, Yemen, Egypt, Libya, and Syria. WATCH: President Obama at the UN in September 2012. Transcript. The Egyptians did not embrace President Obama’s policies or the bad fruits that resulted from them. They viewed it as supporting terrorists. 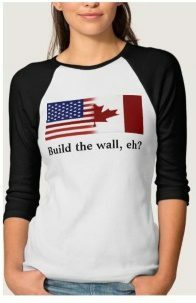 They should know. They had to live with the consequences. Indeed. As I reported in Obama & Hillary’s Benghazi aftermath: Libya on verge of implosion, “Under Gaddafi extremists and the Muslim Brotherhood were opposed. The same applied for former Egyptian President Hosni Mubarak who had banned the Muslim Brotherhood. Mubarak was also deposed.” Shortly after I reported that story, Libya imploded into civil war. Under the Obama administration the Muslim Brotherhood was embraced. The administration carried out that policy objective by supporting President Mohamed Morsi, the leader of the Muslim Brotherhood’s Freedom and Justice Party in Egypt. Morsi had filled the power vacuum that was left after Mubarak was toppled. He was elected Egypt’s president in June 2012—about three months before the Benghazi attack. About month after Morsi was elected, in July 2012, Egyptians were throwing tomatoes and shoes at Secretary Clinton’s motorcade and chanting “Monica,” as Politico’s Kevin Robillard reported. 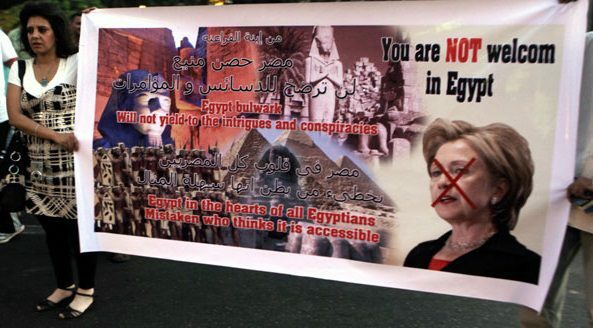 They also held signs (including the one below) stating that Secretary Clinton was not welcome in Egypt. 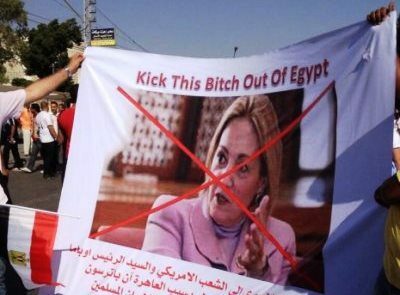 “Kick this b-tch out of Egypt,” read one of the signs. This regime-change Arab Spring policy was also embraced by Republican notables, including Senator John McCain (R-AZ), and former President George W. Bush. In May 2012, Bush penned a pro-Arab Spring op-ed that argued in defense of the “new order” versus the “old order,” echoing his father, Bush Sr.’s “new world order” theme. Despite the aggressive and heavily armed rise of the Islamic State of Iraq and Syria (ISIS), and a deadly “new order” that is expanding there, little has changed policy-wise in the Middle East since the Benghazi attacks. As the Associated Press reported this week, U.S. Senators are in Saudi Arabia to talk about Syrian rebel training. One of the senators is Sen. McCain. In addition, the rebels, who were interviewed in the PBS documentary, described how they received U.S.-backed training in Qatar. This is critical because Benghazi was not just about the confirmed arms trafficking and the MANPADs program that I reported here, but also about facilitating the travel of foreign fighters, from places like Qatar and elsewhere, who were flocking to Libya and Syria. The Egyptians appear to understand the deadly ramifications of the Obama administration’s policies and the monster it had created. It explains why last December Egyptian authorities, now headed by the former leader of Egypt’s armed forces, President Abdul Fattah al-Sisi, imposed travel restrictions on men between the ages of 18 – 40 wishing to travel to Turkey, Syria, Iraq and Libya. By doing so, they are preventing men, who they fear will join Jihadist groups like ISIS, from joining. On September 11, 2012, Ambassador Stevens, information specialist Sean Smith, CIA Global Response Staff (GRS), and former Navy SEALs Glen Doherty and Tyrone Woods were killed at David Petreaus’ CIA Annex and Hillary Clinton’s State Department’s temporary mission facility—which is not a consulate or embassy. Related: Docs: Benghazi was about arms trafficking and MANPADs. Who knew what, when? Update: August 1, 2016: The citizens using Facebook to report on Egypt’s forgotten war, The Guardian.